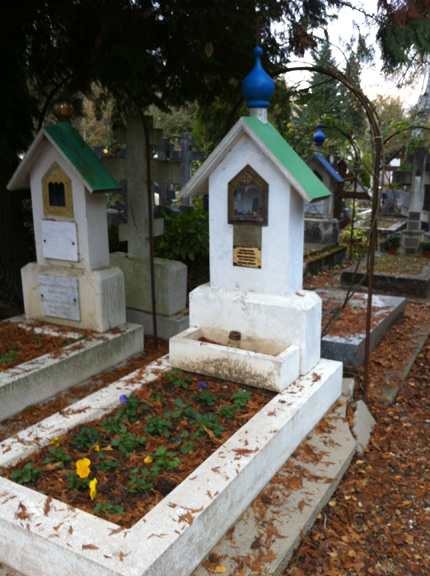 In November 2015, I visited the Russian cemetery (le cimetière russe) in Sainte-Geneviève-des-Bois, just south of Paris. My companion, the anthropologist Jean-Pierre (JP) Warnier, was an excellent guide and pointed out various little details. Entering through one of the many gates we observed the other visitors, what they brought with them and what they left behind. It was the week following All Soul’s Day and there were fresh flowers placed on many of the graves while a few of the smaller caskets had candles that were still flickering. Established in 1879, most, but not all, of the cemetery is intended for Russian emigrants and many celebrities and nobility are buried here. As I walked through the cemetery, my eye was drawn to the obvious references to the Eastern Orthodox tradition: suppedaneum crosses with the diagonal foot brace, and headstones shaped like little churches that referenced the roof and dome of the Dormition church (Église de la Dormition-de-la-Mère-de-Dieu) in the same area, built in the style of Novgorod Churches of the 15th and 16th century. 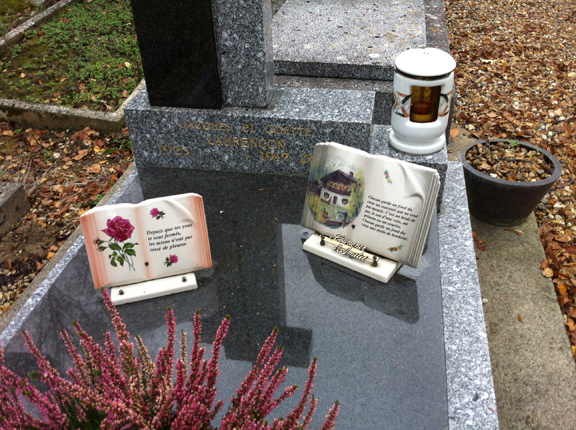 Icons placed at a grave. Headstone shaped as 15th c. Novgorod church. 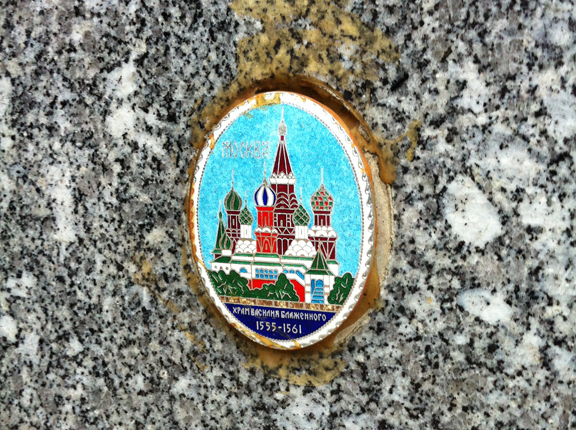 Ceramic medallion with image of Saint Basil’s Cathedral in Red Square, Moscow. Each grave told a story. 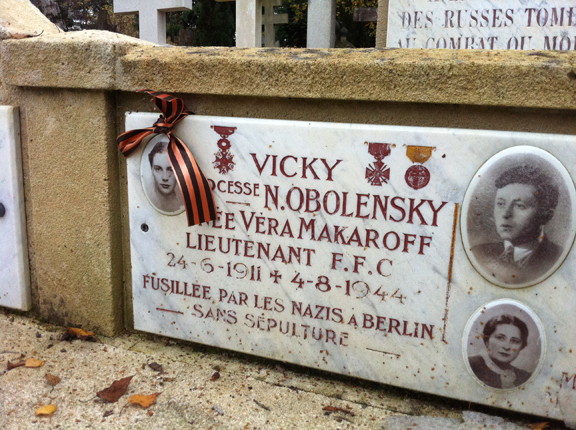 There is a section of the cemetery that is devoted to the ‘taxi drivers’, Russians who came to France after the collapse of the aristocracy and the 1917 Bolshevik Revolution. Those who came to France arrived with little more than they could carry. Lacking knowledge of French and resorting to manual jobs, many became chauffeurs. 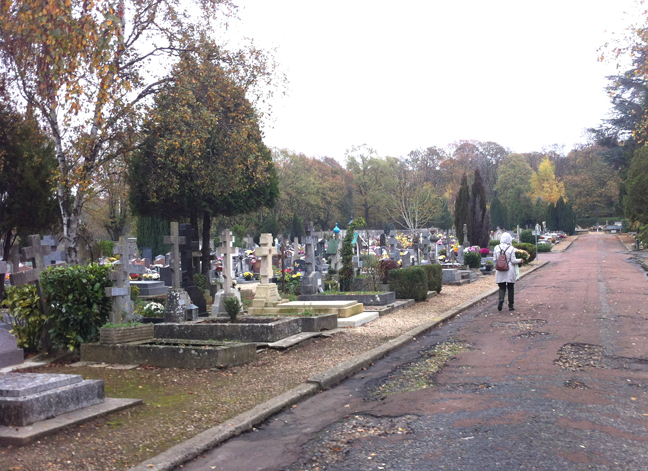 JP also alerted me to the presence of the ‘carrés militaires’ or squares with military graves. The graves were well-dressed, covered with military symbols, ribbons and Russian icons, forcing me to ponder the inextricable link between temporal and sacred power. Others were simpler, with just an orange and black striped ribbon (Ribbon of Saint George) to identify the person as a war veteran. Many told the story of people caught up in war; for instance, the stripes on the plaque of one woman’s grave identified her as a concentration camp internee during WWII. 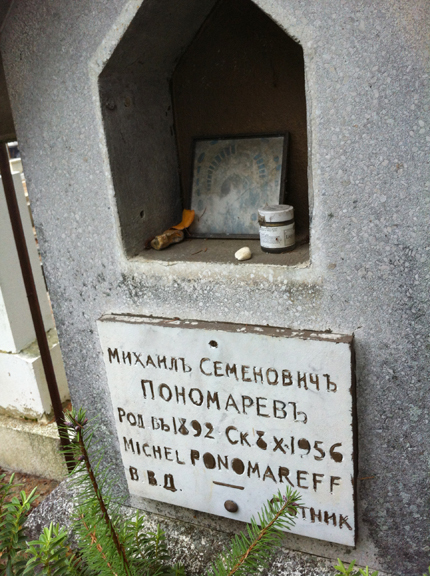 Military grave with Russian icon. 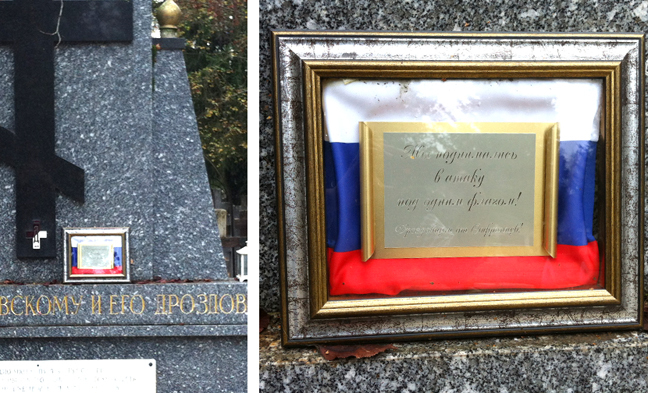 Russian flag on a grave. 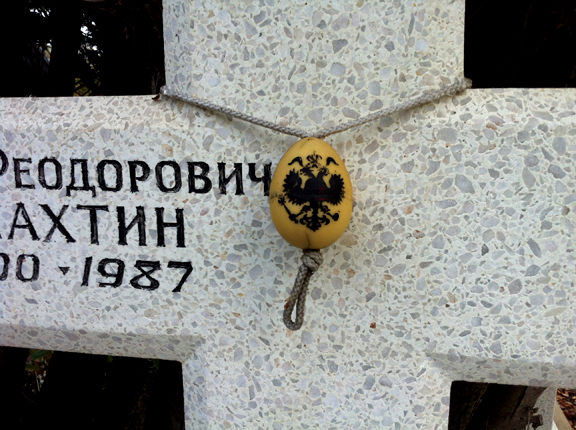 Ribbon of Saint George marking the tomb of the resistance fighter. Plaque with blue and white stripes specific to internment in a camp. 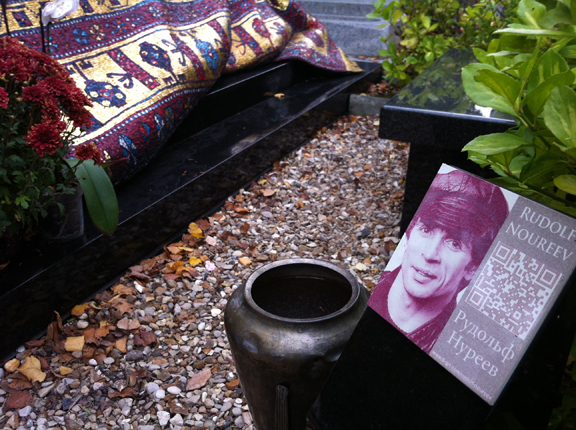 The culmination of our trip was the spectacular tomb of the celebrated Russian dancer, Rudolf Nureyev (Noureev in French). 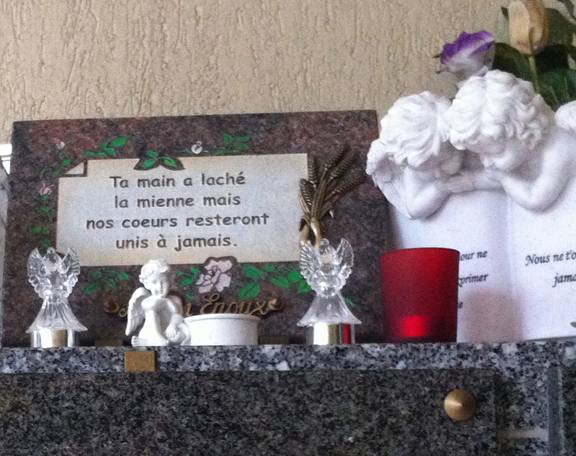 Nureyev’s grave had become a shrine, literally the poster image for the cemetery, featured on the small sign as I entered the gates earlier. From a distance, Nureyev’s grave stood out as a bright ocean of colour, an illusion of a thick, woven carpet draped over, and hinting at the contours of, an invisible coffin. 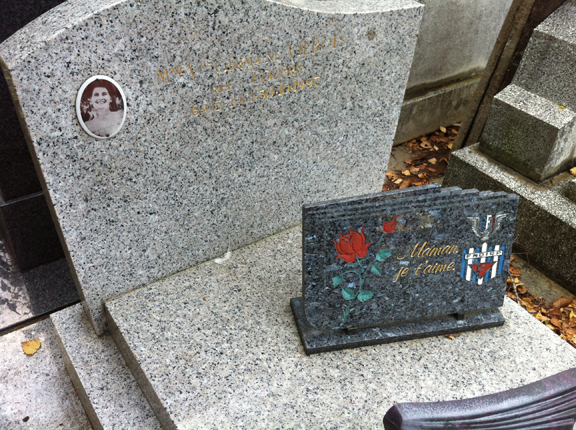 Like many other graves Nureyev’s had a small granite bench so that people could sit next to it. 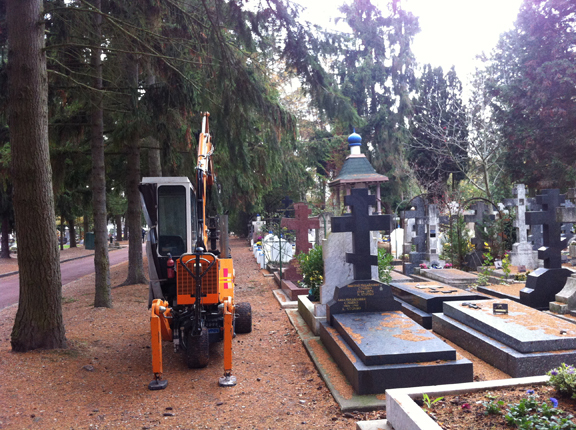 In marked difference, his grave had a large photo with a digital QR code linked to a site with further information. The mosaics on the Byzantine design of the ‘rug’ twinkled when the light caught the squares of gold while the many distinct colours of turquoise, red, orange, blue, white and green became apparent only as we got closer. One man who was visiting his father’s grave nearby stopped briefly and commented that he thought it was a real carpet. 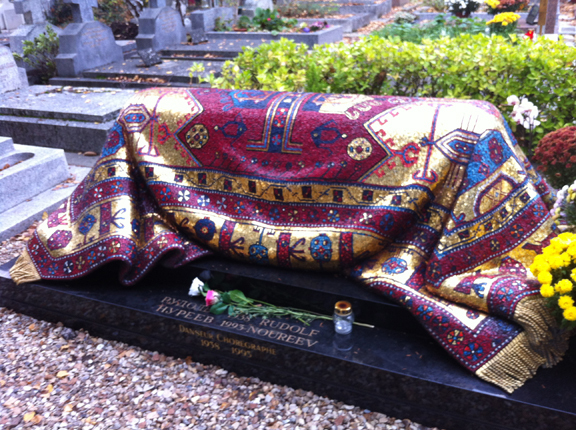 Nureyev’s tomb with mosaic ‘oriental carpet’. QR code next to Nureyev’s tomb. I examined the execution of the mosaic work. JP told me that people who came by initially plucked out pieces of mosaic as souvenirs and that it required constant renovation. This bit of information was suddenly animated when he bent down and picked up something from the ground. Opening his palm, he showed me a small twinkling piece of gold glass. Squatting, I noticed several pieces of mosaic nestled within the gravel and dried leaves. Some were slender cuboids of coloured glass that seemed to have been used to chip off smaller pieces, and had been left behind as waste. I spent some time collecting mosaic pieces from around Nureyev’s tomb, shared some with another tourist and took some back home with me. Container of gold paint previously used to highlight letters. Digging and leveling work underway. Graves hide disturbing contents that we cannot and would rather not see. But, animated by the movements of objects and people, they also become revelatory. Rituals of animation range from lighting candles and laying flowers to using a mobile phone to capture a QR code or a bottle of gold paint to repair faded lettering. Transcendental references abound but are confronted by the insistent materiality of faded photos, fragments of ribbon, tchotchkes and even dust. Added and subtracted with the passage of time, these objects form a layer that wraps and enlivens the crypt, and challenges the analytical separation of votives, funerary objects and souvenirs.